"Hello Golden Age Premier, I recently purchased a Pre-73 Premier and I just wanted to reach out to let you know how great of a product it is. It's built very well and really sounds amazing. I will be picking up another one soon to complete the rack. Thanks for making something so great and so affordable. Your product line is exactly where the industry should be price wise and performance wise now that the music industry has shifted from the days of millions of records being sold.Thanks, Ryan Kyle Hemby"
I send my thanks to Ryan for his wonderful feedback and for allowing me to share it! - Gain switch range is 20 - 80 dB. Line mode switch, gain is reduced by 30 dB in line mode. - Selectable two position high frequency air eq boost mode, 3 or 6 dB @ 30 kHz. - Selectable 6 dB/octave high pass filter at around 80 Hz (HP1) or 200 Hz (HP2). - 14 dB output pad allowing the user to overdrive the output stage and transformer. - Switchable impedance in mic mode, 1200 or 300 Ohm, will change the tone of most mics. The input impedance in line mode is 10 kOhm. - The output level control makes it possible to make fine gain adjustments and also to overload the main gain stage(s) for more character. - Classic style knobs and buttons. - Prepared for mounting one or two units in the UNITE PREMIER rack kit. It can also be mounted in one of the other UNITE rack kits and combined --with the red and black Golden Age Project products. - Connector free internal wiring, all connections except the ones to the gain switch --are soldered for the purest signal and most longterm stable signal path. 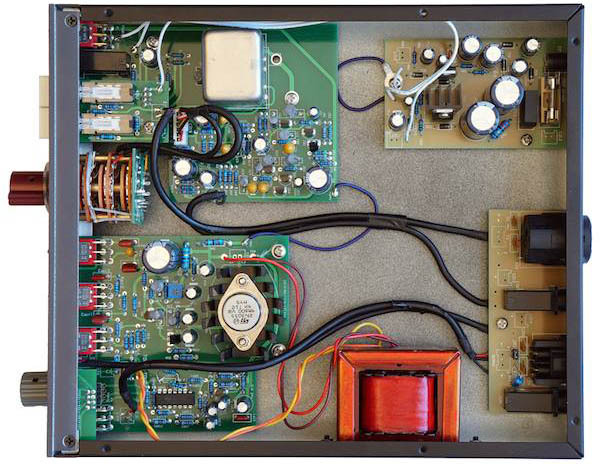 - UK made Carnhill input and line output transformers. - Polystyrene capacitors in the amplifier circuits. - Beefed up power supply. - Sturdy toggle switches with gold plated contacts. - a classic style with grey front panel, a red gain knob, white rectangular push button switches and a grey output level metal knob. - most connections are soldered, only the connections to the GAIN switch uses a connector. Compared to the MKIII, 20 connection points that are directly located in the signal path are replaced by a soldered connection. Adding connections for the power rails, 24 connection points are soldered. 1. the cable wire crimped to the female metal connector part. 3. the male connector metal part soldered to the circuit board. Only no 3 is used in the soldered connections in the PRE-73 PREMIER, so there are actually 24 x 2 = 48 less connections in the PREMIER compared to the MKIII Plus. The advantage of doing it like this is a higher signal integrity and better long term reliability. The disadvantage is that it that it´s much more work demanding to use soldered connections, it makes the production process more complicated which increases cost. This is reason why most manufacturers use connectors instead of soldered connections. - a - 14 dB output pad is added allowing the user to overdrive the output stage and transformer. - Classic 23-position Gain/Line switch with 5 dB steps and a gain range of 20 to 80 dB for mic and -10 to +20 dB for line. - A two band LF (+/-15 dB) and HF (+/-20 dB) shelving equalizer with two selectable frequencies for each band. - Inductor based +/- 15 dB midrange equalizer section with three selectable frequencies. The lowest one is selectable between 350 and 700 Hz. - Separate combo XLR/TRS jack for the MIC and LINE input and separate output XLR and TRS jacks for flexible connections. - Prepared for mounting one ot two units in the UNITE PREMIER rack kit. It can also be mounted in one of the other UNITE rack kits and combined with --the red and black Golden Age Project products. - UK made Carnhill microphone input and line output transformers. - The pcb is prepared for the Carnhill 9046M line input transformer.